As promising as sunrise over a deserted beach, this pale peach glass pearl and clear AB Swarovski crystal floral design is pure femininity. 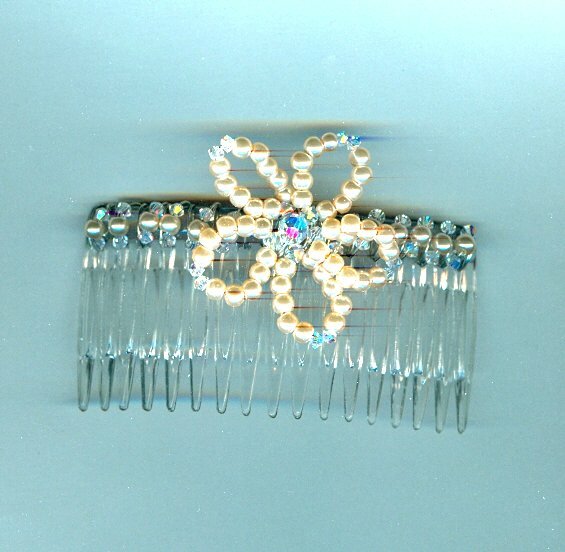 The flower measures about 1-3/4 inches across, and stands proud of the three inch wide acrylic hair comb. With their auaora boreale finish, the crystals twinkle like nothing on earth! 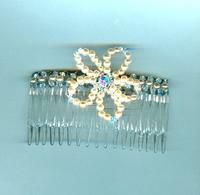 Why not hold back your bonny hair in style and be noticed at the same time? When colourful beauty is what you want, look no farther than SPARKLE PLENTY. All our one of a kind and limited edition artisan beaded jewelry is individually handcrafted in our studio in Los Angeles, California. Be sure to browse our online store to see all our bracelets, necklaces and earrings and other fashion accessories.